Each video ever produced contained titles, because they are such an important part of a video or a film, and yet we often don't pay much attention to them. Titles contain crucial information about the video that cannot be conveyed through images such as the title of the movie, or a place and time in which the story takes place. Although titles can be an artwork in their own right, adding titles to videos is also a fast and simple process because most programs for editing offer title templates that are easy to use. Premiere Elements owners can add titles to their videos with relative ease although some previous video editing knowledge is required, and in this article, we will show you how to add titles to your videos in this video editing software. All titles can be divided into two categories, still titles are what their name suggests, a text that stands still during its on-screen time, while motion titles move and create a visual dynamics on the screen. If you would like to add titles to your project in Premiere Elements it is best if you do so in the 'Expert' mode because that way you'll have more options than if you use 'Quick' or 'Guided' modes. Before you proceed any further in the process of adding titles to your video, you first must make sure that a video clip is on the timeline, and then you must place the playhead at the position in the video where you would like the titles to appear. In the next step, you need to click on the 'Text' menu and then select the 'New Text' option from the drop-down menu. In the 'New Text' sub-menu, click on the 'Default Text' feature to add a text file to the timeline. However, this isn't the only way you can add titles to your project since Premier Elements also features the 'Titles and Text' panel that offers a number of 'Classic' title options. Select the title you want to use in the panel and drag and drop it onto the timeline. The 'Titles and Text' feature also provides 'Motion Titles' option that will enable you to bring your text to life. All you need to do is select the 'Motion Title' you like and drag it to the timeline. After positioning it on the timeline you can customize each motion title you use to meet your demands by opening the 'Adjustments' tab. You can easily adjust text, backgrounds, or graphics and if you want, and you can save the motion title you customized and use it in another project. Creating titles in Premiere Elements is not a complicated task, but if you have been using this video editing software you know that it has its limitations. Video editors who need almost limitless title options that are easy to apply should consider using Wondershare Filmora video editing software. 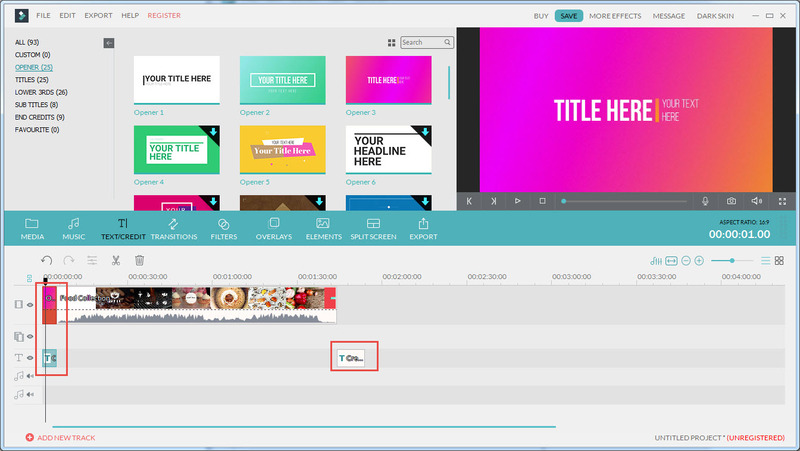 The Wondershare's video editing software Filmora offers numerous text effects that can be easily dragged and dropped onto the editor's timeline. What's more, Filmora features a variety of preset 'Openers' that can be found under the 'Text/Credit' option and all you need to do is just insert the text you want to be displayed on the screen. Filmora enables its users to add or remove 'Text tracks', which means that you can feature several different titles on separate tracks, which will enable you to have a better control over the titles you include in your project. The abundance of the title features provided by Filmora makes the process of making titles for your videos simple, fun and easy. What’s more, Filmora also provides some text and title special effects, such as classic title, creative title, classic lower third and creative lower third.